Cacho de Cabra is a medium-spicy pepper that is both native primarily to Chile and some parts of Peru. In Spanish “Cacho de Cabra” means goat horn, a reference to the pepper’s shape. The country of Chile is not generally known for its spicy food. Because of its name, many foreigners assume that Chile must have something to do with chile peppers — if not because they export large amounts of them, then because the country seems to be shaped like a very thin pepper. Both assumptions are false, since the country’s name actually comes the Mapuche word “chilli”, which means “where the lands end”–a reference to Chile’s long stretches of coast. Regardless of this fact, peppers do have a role in Chilean food and agriculture, although a somewhat mild one. Growing peppers is not too difficult in Chile. A few varieties are frequently farmed there, though peppers in general are not as commonly grown as other agricultural staples. Many different kinds of hot peppers, including the Cacho de Cabra, are natives to Chile. In fact, the native people of Chile, the Mapuche, have been cultivating and growing peppers in the Santiago region for centuries. Although a couple of chilli peppers are native to Chile and are used in some of the more spicy recipes of the region, one can’t really say that Chile is known for its spicy food. That being said, there are some recipes in this country that have a bit more of a bite to them. Of the few truly spicy recipes that Chile can boast, some of the most flavorful include the spice called merkén. Merkén is made of Cacho de Cabra chile peppers. It is dried, smoked and ground in a process that the Mapuche invented many years ago. This gives the pepper a rich smoky flavor. It is then mixed with coriander, salt and cumin. 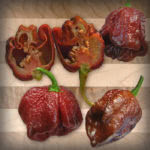 Aside from its distinct smoke flavor, the spice also has a mild bite due to the moderate spiciness of the Cacho de Cabra pepper. In recent years in Chile, merkén has gained a lot of popularity and is one of the most popular additions to any meal. It is not uncommon for a Chilean family to keep a container of merkén on the table, right next to the salt and pepper. The spice is added to any dish that could benefit from its unique spicy and smoky flavor, usually to the individual’s taste. Cacho de Cabra may not be the hottest of all hot peppers, but due to the popularity of merkén, it is undoubtedly one of the most commonly found chilli peppers in this South American country. Shape: This red pepper is long and pointed, similar in shape to the goat horns from which it gets its name. The general shape is reminiscent of a jalapeno pepper, though somewhat more elongated. Occasionally the pepper’s body will twist around, creating curls. Taste: When made into merkén, Cacho de Cabra has a warm, smoky flavor. When eaten fresh, the pepper is aromatic and has a medium spiciness.